If Catherine McPherson (Sutherland) could have foreseen what lay ahead for her in that faraway land on the banks of the Red River, would she have left her native Helmsdale, Scotland, in the year 1813? Chances are that she would have, for subsequent events proved her to be a woman of great courage and resource. It must have taken a stout heart to carry on nursing the sick after typhoid fever broke out aboard ship and among its victims was the doctor, himself. It took stamina to see her laboriously-built log home carried off downstream by flood waters, and stay, and begin all over again. These were but a few of the troubles which beset the early Selkirk Settlers. Many left for Upper Canada where life was less harsh; but a staunch few stayed on, facing incredible difficulties. Catherine was among those who stayed. Catherine McPherson was 26 when she and her 18-year-old brother, John, sailed on the Prince of Wales with almost a hundred other settlers bound for Selkirk’s settlement in Assiniboia. It seems that the rest of the family intended to follow for in a letter from their brother, William, dated 7 July 1815, from Gaylbiabb, Sutherlandshire, Scotland, he gives as their reasons for "not going out this year" that their mother was in poor health and "we do not sell our beasts unless we would sell them for half price becausewe sold the best of them before we paid your own passage". Catherine and John, then, went ahead to pave the way for the others to follow. But aboard the Prince of Wales all was not well. The dreaded ship’s fever had broken out. One man died and was buried at sea. When Dr. Laserre succumbed to it, Catherine went on caring for the fever-stricken and we are told, it was to her that the others looked for guidance. The party was hastily put ashore, not at York Factory where they might have found help and supplies, but on the desolate coast at the mouth of the Churchill River. Here, food and game were scarce and because it was too late in the year to start out for Red River, they must quickly construct log shelters. Under these appalling conditions, they must care for the sick and shift for themselves. They were ill-prepared for a winter when temperatures dropped as low as -40° to -50° F. There were several more deaths from fever and three attributed to ‘consumption’. One woman of 45 was left with a family of four and another with three little children the youngest of which was two. The party of settlers, after a long and arduous journey reached the Forks in June, 1814, and once there, set about building their homes. Catherine McPherson and Alexander Sutherland, one of the young men of the party, were married shortly after arrival. [See note 1.] They built their home on Point Douglas, near the site of the present Louise Bridge. Sutherland Avenue runs from where their log house stood on the river bank through what was the Sutherland lot. The newcomers settled on their small farms which ran in long narrow strips back from the river. The greater number located along the Red River for nearly four miles in the area of what is now, West Kildonan. At first the settlers were well-treated by the Indians, Metis, and traders who were already in the territory. However, this was not to last. Rivalry between the fur-trading companies stirred up trouble. There had already been repercussions of this in Scotland before ever the colonists sailed. Rumors were spread of the desolate nature of the country and the wildness of its inhabitants. John McPherson received a letter (dated as early as 7 July 1815) from his brother, William, in Scotland in which was stated, “we were getting good and bad reports concerning the place [Red River] but whatever account you will givethat is what we will believe.” William went on to enquire if there was a kiln of mill “we hear there is no mill nor stones in the place to put up a mill.” He asked what kinds of tools they would need if they emigrated to Assiniboia. In spring they were rescued and brought back by Colin Robertson on his way west with a Hudson’s Bay Company brigade. When Governor Semple arrived with a new group from York Factory, they must have taken heart, once more. But in June 1816, Semple and twenty-one of his men were killed in the confrontation at Seven Oaks. North West Company men induced most of the settlers to go and take up farms in Upper Canada. A handful of the most stout-hearted, Alexander and Catherine Sutherland among them, refused to abandon Red River. Lawsuits resulted from the acts of violence and two of the men subpoenaed to appear as witnesses were John McPherson and Angus McKay. After the court cases, both men settled on farms near the shore of Lake Erie, John, at Port Talbot. Neither man ever returned to Red River, and Catherine was never again to see the brother who had come out with her from Scotland. Envelope to letter dated May 1823, at Helmsdale, Scotland. from Catherine’s brother, William McPherson. 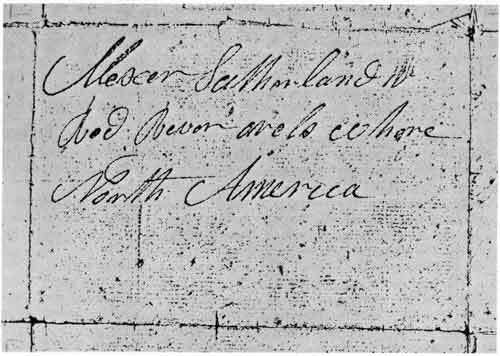 Note that the letter is addressed to: Mr. Sutherland, Red River or Elsewhere, North America. It bears no stamp, only the mark of a seal on the back. Yet the Sutherlands stayed on in Red River. One wonders why after suffering persecution, famine brought on by a plague of grasshoppers and innumerable privations. Letters came from eastern Canada only once a year on which the postage charge was about 40c per letter. And from Scotland the mails and packages arrived once a year or even less if storms delayed the ships. Like the others, the Sutherlands were putting down roots. Their only child, John, was born in 1821, and though letters from Port Talbot continued to urge them to “comeand locate near us,” they decided to remain in their home at Point Douglas. Like all pioneers, they were kept very busy. Among the tasks women performed were baking the family supply of bread, setting milk in pans, skimming the cream and churning butter. After sheep were brought in, yarn must be spun, knitted into garments or woven into cloth. Soap, candles, and starch were all made in the home. Starch was made from potatoes and one use of it was for stiffening the white ruffled caps or “mutches” which the women wore on special occasions. Candle making must have been a task for a number of years, for Healy records that one of the first kerosene-burning lamps was brought into Red River from St. Paul in the late 1860s. Of necessity, the young people, too, must have had to work long hours in the home and in the fields. Yet one can’t read their letters without realizing they must have taken advantage of the education available at the time. The book they probably knew best was the Bible, for the family gathered daily for prayers. This early training and their strong family ties illuminate all their correspondence. This is youth speaking to youth in 1844! Though they worked long hours, life was not all gloom and hardship. Healy speaks of weddings where festivities were kept up for three days. Great roasts of beef and mutton were hung on spits before open fireplaces to be served with boiled potatoes, and plum pudding, to the guests. In those days everybody in the community were considered guests. New Year’s Day was celebrated by visiting from home to home. The Indians, who had always been friendly to the settlers, enjoyed this hospitality and sometimes came, clad in full ceremonial dress for the occasion. The young people drove to parties by cariole or sleigh, and fiddles provided the music for dancing. Ice was kept clear on the river for games, and in summer they had picnics. Favorite places for picnics were at Bird’s Hill or Stony Mountain. It carried away Catherine’s home on Point Douglas. By this time the Sutherland’s were in their mid-sixties, homeless, and once again, faced with making a beginning. But their son, John, now married to Janet McBeath, was able to help rebuild. They chose a lot on higher ground on the opposite side of the river, the ‘French side’ near Rid’s old home. Here the older Sutherlands lived out their days. It is said the whole family learned to speak French as well as English, and had a working knowledge of Cree. Because of this close contact, John Sutherland became a link between the French and Kildonan people. Kate’s interest like most of the Kildonan settlers was centred about the ‘kirk.’ For almost 40 years they had patiently awaited a minister of their own faith. During that time they attended Anglican services. When Rev. John Black arrived in 1851, they began to build Kildonan Church. The faithful Kate was always among the first to arrive at church. She carried the treasured Bible she had brought with her from Scotland, wrapped in a white handkerchief. After an early breakfast each Sunday, her son or one of her grandsons would row her across the river. From there she walked, resting at intervals along the way. Ironically, just before the shooting, the Sutherlands had been happily welcoming the father, John Sutherland, home. He, with other men of the settlement, had been taken prisoner by Riel and had been released that morning. The first they knew that something had happened to John Hugh, was when the horse returned, riderless, with a blood-stained saddle. After John Hugh’s death, a group of men who had come in by way of Portage la Prairie, to go to the aid of the settlers, were taken prisoner. One of this force, Major Charles A. Boulton was sentenced to death. Donald A. Smith and others interceded for the condemned man. When Major Boulton was released, he went to the Sutherland home to thank them for what they had done. In the years that followed Catherine’s son, John Sutherland, was more and more active in community affairs. He was a member of the Council of Assiniboia, then Sheriff and in 1871, was appointed to the Senate by the government of Sir John A. Macdonald. Dr. George Bryce places the Alexander Sutherland family among those on an Honour Roll. These families he declares, “held fast to Red River Settlement. These were the real Kildonan settlers whom Lord Selkirk saw on his visit in 1817.” Catherine Sutherland, this woman of kind heart and staunch courage, was one of them. 3 September 2013: Ms. Chloe Clark, Archivist of the Lord Selkirk Association of Rupert’s Land, offers the following corrections of the original text of this article. 1. This is incorrect. Catherine McPherson married a man named Alexander Sutherland, but he was not the Alexander of 1813. She married an Alexander Sutherland who arrived in 1815 and they were married probably in 1817. The Alexander Sutherland who was with the 1813 group eventually relocated to the US. 2. This is a story which is often repeated, but in fact the McKay child was born after the settlers had safely arrived at Red River. The McKays and a couple of others did stop for a few days on the trek from Churchill to York Factory, as Jean was exhausted because she was about four months pregnant. Archibald McDonald, who led the group, was quite surprised when he learned of her condition as he was unaware of it when they set out from Churchill. 3. The settlers did flee to Jack River, but they did not remain the winter. They returned to Red River the same year under the leadership of Colin Robertson. The winter spent at Jack River was the following one, 1816-1817, after Seven Oaks.